Like all Howells, the Rhapsodic Quintet is basically song. Howells liked strings (he composed various works for string orchestra as well as for quartet) because of their nearness in character to the human voice, and no woodwind instrument is more vocal in terms of expressivity and melodiousness than the clarinet. As for ‘rhapsodic’, this is often used in a pejorative sense, implying a ramshackle structure. By no stretch of the imagination could the structure of the Rhapsodic Quintet be described as ‘ramshackle’. On the contrary it is highly organized, and the listener will have no difficulty in spotting the two main themes and following their exposition, development and recapitulation. ‘Rhapsodic’ refers more to the overall one-movement shape, which encompasses a number of contrasting moods or phases. But Howells is no meanderer; he knows where he is going and what he has to do on the way. He is also a supreme poet. Thea King reckons the closing section of the quintet to be one of the loveliest moments in music—the peace of ages is in it—and she is sure to find many to agree with her. It was said earlier that the Howells Quintet belonged to a lost world. Its linguistic sureties—not merely tonal but diatonically tonal (Howells’s personal brand of harmonic/polyphonic chromaticism was a much later development) would strike a post-war generation of composers as insular and anachronistic. Elizabeth Maconchy is a case in point. When informed that her own Clarinet Quintet was to share a programme with Howells’s, her reaction was ‘Oh, Lord!’. That this was so should not of course be interpreted in any way as a criticism of Howells, still less of Elizabeth Maconchy; rather was it a succinct and spontaneous comment on a process of historical inevitability. English music could not go on feeding on its own reserves for ever: inbreeding is always unproductive in the long run, and though Maconchy was a pupil of Charles Wood and Vaughan Williams she also spent a short time in Prague with the Czech composer Karel Jirák. Her musical outlook has always been more European than familiarly English, nowhere more so than in her chamber music (a sphere in which composers, being less concerned with the problem of mass-audience reaction, often feel free to adopt a take-it-or-leave-it attitude). Maconchy’s Quintet of 1964 shares with Howells’s a certain fondness for rhapsodic, florid textures, long singing lines, lively and probably dance-derived rhythms; but the musical substance is entirely different. Howells dreams of the England of A E Housman and Rupert Brooke, and let no one tell us it never existed (probably it didn’t), for where would we be without our dreams? Maconchy lives far more in the then-present, her music has a ruder, earthier aspect—even wild (can we hear something of her Irish origins in the second and fourth movements?). She is not concerned with indulging her listeners or sugaring pills, but she does offer sweep and stamina and an inspiring professionalism. Arnold Cooke is less wild; but then he is not (unlike Maconchy and Howells and Josef Holbrooke) a Celt. His music is more soberly classical in outlook and reflects the strict contrapuntal disciplines of his teacher Hindemith (a year older than Maconchy, Cooke, like her, felt that in statu pupillari he needed more than the English musical Establishment of the day was able to offer). Cooke’s rigorous approach to his craft is unlikely to create glamour of texture or cosmetic charm of any kind; its strength is pre-eminently in line, in integrity of line and form. He would surely agree with Blake, who saw line as energy, as the signature of life: ‘How do we distinguish one face or countenance from another, but by the bounding line and its infinite inflexions and movements? What is it that distinguishes honesty from knavery but the hard and wiry line of rectitude and certainty in the actions and intentions? Leave out this line and you leave out life itself … all is chaos again …’ It must be said that hardness and wiriness of line, if carried to excess, is apt to head to dryness; but in Cooke’s music, as in the best of Hindemith, a nicely-judged lyrical element softens and refreshes. It was Gervase de Peyer who gave the first performance of the Maconchy and Cooke quintets (the latter in 1962, during the Festival of London for that year, for which it had been commissioned). De Peyer also launched the Benjamin Frankel Quintet, despite the latter’s intimate connection with Thea King. His dedication reads: ‘For Thea Thurston, to Jack’. Frederick (Jack) Thurston was one of the most celebrated clarinettists of his generation. He inspired composers of the calibre of Ireland, Bax, Bliss, Rawsthorne and Arnold not merely to write sonatas and concertos for him, but also to include made-to-measure solos in orchestral works knowing that quite likely he would be around to play them! He was not, however, around as long as he should have been. Cancer cut short his career in December 1953 at the age of 52, and it was to honour his memory that Frankel in 1956 composed his Op 28, his Clarinet Quintet. This was a BBC commission for the Cheltenham Festival and was first performed by the Allegri Quartet and de Peyer, a pupil of Thurston’s. The co-dedicatee, Thea King, had been not only a Thurston pupil but also his wife; but in those days she was not considered well-enough known to give a prestigious first performance on the air, so de Peyer was engaged. Both the Thurstons and de Peyer used to play for Frankel on his film recording sessions, he being one of a Holy Trinity of film composers who dominated post-war British cinema until well into the ’60s. The other two were William Alwyn and Malcolm Arnold, and, like them, Frankel (1906–1973) never allowed his facility or his material success to compromise his non-film music. The Quintet is a case in point. In one sense the musical language is ‘difficult’ in that it is highly dissonant, if not particularly complex; yet it is also ‘easy’ since, like Berg’s (with which it has some affinities), it communicates; it delivers its message to a public which does not, perhaps, have to understand every last note or chord. We do not, after all, look for precise meanings in a poet like Gerard Manley Hopkins, yet he rarely leaves us in doubt as to what he wishes to convey. No one, I imagine, whatever their level of musical sophistication, could be left unmoved by the finale of the Quintet, surely one of the sublimest elegiac utterances in English music of any period. For Thurston to have inspired this piece after his death is as great a tribute to his artistry as any of the music he caused to be created in his lifetime. Finally a brief tribute to one of the English Revival’s true Mystery Men. The vast output of Josef Holbrooke (1878–1958) has left hardly a wrack behind, but looking at this tiny sketch makes one long to view some of the larger canvases. 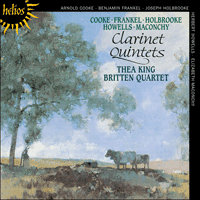 (Thanks to the promotional industry of the composer’s son Gwydion Brooke—whom Thea King describes as the finest bassoonist she’s ever known, an artist of the first rank—we may sometime soon have the chance to do so.) Eilean Shona is an island off the west coast of Scotland, and this piece is a re-working of what was originally a song to words by Gerald Cumberland. What the text was about need hardly concern us, so immediately atmospheric is the music—a few bars and we are in thrall. That is real Celtic magic.